Despite their connection to Melissa McCarthy, it seems Rachel, Hugh, and Larry are back to being nobodies, for the nonce. TV Land has cancelled the Nobodies TV show. The first season of the sitcom originally premiered on the Viacom-owned network, then the parent company tried to move it to Paramount Network for its second season. When it didn’t catch on there, Nobodies quickly retreated to TV Land, where it will not see a third season, despite an increase in ratings, over season one. A TV Land sitcom, Nobodies stars creators, writers, and alumni of The Groundlings improv company, Hugh Davidson, Larry Dorf, and Rachel Ramras, as fictionalized versions of themselves. The trio is just trying to make the big time, with a little help from their famous friends. Guest stars in the second season include Kristin Wiig, Sia, Leslie Bibb, Cedric The Entertainer, Michael MacDonald, Ben Falcone, and Melissa McCarthy, with Mark-Paul Gosselaar recurring. 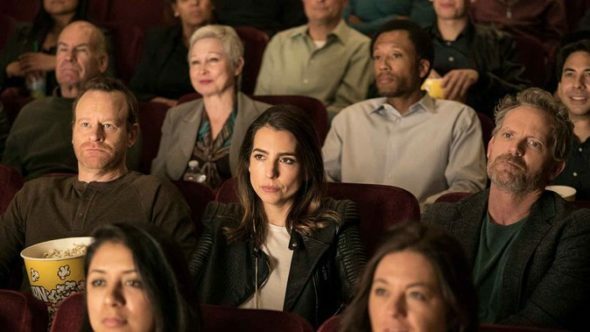 The second season of Nobodies averaged a 0.08 rating in the 18-49 demographic with 393,000 viewers. Compared to season one on TV Land, that’s up by 8% in the demo and up by 10% in viewers. Learn how Nobodies stacks up against other TV Land TV shows. After bowing on the niche cable network, Nobodies averaged a little more than 400,000 total viewers (with three days of DVR). As part of Viacom’s push to create a general entertainment hub in Paramount Network — which is now also overseen by Cox — Nobodies was upgraded to the former Spike TV. Season two bowed March 29, when it was supposed to get a halo affect from Paramount Network’s Heathers — which also moved from TV Land. When Heathers was delayed and ultimately scrapped, that left Nobodies to find its own audience on a larger platform. The comedy aired twice on Paramount Network before moving back to TV Land, where it posted a modest gain. The modestly reviewed show finished up a tick compared with season one, though behind TV Land’s flagship comedy Younger and Teachers. With TV Land already having two scripted comedies to pair together, there was no need for a third in Nobodiesas the cable network is no longer accepting pitches for scripted series. What do you think? Are you a fan of the Nobodies TV series? If it were up to you, would this TV Land TV show have been cancelled or renewed for season three? More about: Nobodies, Nobodies: canceled or renewed?, Nobodies: ratings, TV Land TV shows: canceled or renewed? I don’t think Paramount (Spike) is much better…I think the only thing I’ve ever watched there are new episodes of Cops. Other than that, it’s another old reruns network (though with old Paramount movies thrown in the mix). The show has comedy, drama and a sense of style. I waited two seasons for Hugh and Rachel to get together. Finally they do at the end of season 2, and now you guys cancel? I never understood why shows do that – you build up these characters and the stories and then cancel 9/10 for no reason. Idk, they’re should be a season 3 or at least a short season to at least finish the story. Just in my opinion. That is too bad as this was a truly amazing show.